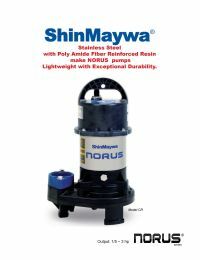 ShinMaywa Norus submersible pumps are some of the most reliable and durable pumps sold in today's watergarden market. 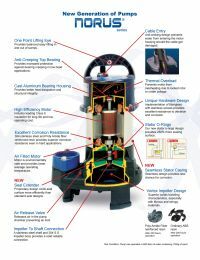 The outside has a unique hardware design made of fiberglass and a cast aluminum bearing housing for superior heat dissipation and structural integrity compared to competing pumps. The Norus series is resistant to corrosion due to its 304 stainless steel and poly amide fiber reinforced resin, and stainless steel shaft and impeller. An ultra long life span, low operating cost, and reliability make the Norus series from ShinMaywa a best buy for homeowners. 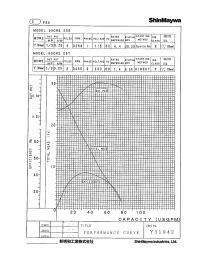 Can handle solids up 1-1/4"